Social Productivity: Who Wants to Be a Muslim Millionaire? Have you ever wondered how YOU can make a real difference and be socially productive this Ramadan? 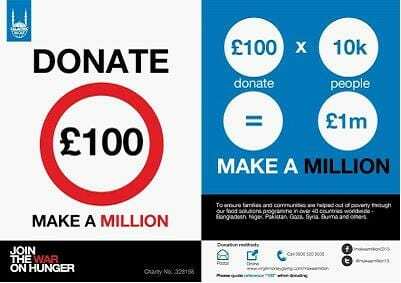 Why not start with Islamic Relief’s Make a Million campaign? Everyone wants to be a Muslim Millionaire, and here’s the SECRET FORMULA on how to gain a reward worth millions this Ramadan. GIVE in charity and be socially productive. It is shocking and deeply saddening that 1 in 8 people will go to bed hungry every night, despite the fact that there is enough food in this world for everyone. Ramadan is an optimal time to feel and step into the shoes of those who go hungry around the world. It is also the blessed month with the opportunity to practise the many Prophetic traditions, one of which was to be extra generous and give in charity as the Prophet would do, even to the extent that of borrowing borrowed money to help others! This is where the Make a Million Campaign comes in! Therefore our charity is actually a source of manifold reward. In some sense, it teaches us that even the small amount of charity we give with a sincere heart can equate to the million dollar! 1. LIKE the Make a Million Facebook Page. 2. Find 10 FRIENDS who will raise £100 then get them to find another 10 friends! 3. SHARE the page with your friends & family via Twitter, Facebook. 5. FUNDRAISE the hundreds which will multiply to help us reach a MILLION. 7. THANK everyone who participates with a ‘Thank You for helping us Make a Million’ text. Be socially productive this Ramadan by taking on the Make a Million challenge and helping us reach our target so we can feed the world’s poorest. We’d love to hear how you go about making your million in the comments below!